Since moving to our farm some five or so years ago, we've fallen in love with mulberries. They grow in abundance on our land and new trees appear every year. Like weeds, some would say! But this sort of weed (like many others) is welcome by me. Ripening earlier than all of the bramble fruits (like raspberries and blackberries), they catch us before we're buried in produce to can, freeze, or process. And because they grow on thornless trees, the picking is painless! Despite my mulberry affections, we found that for every berry we harvested in a rainstorm of ripe berries cascaded down around us, directly onto the ground. Mulberries hang on so tenderly when ripe that it was impossible not to lose more to the grass than we placed in our baskets. 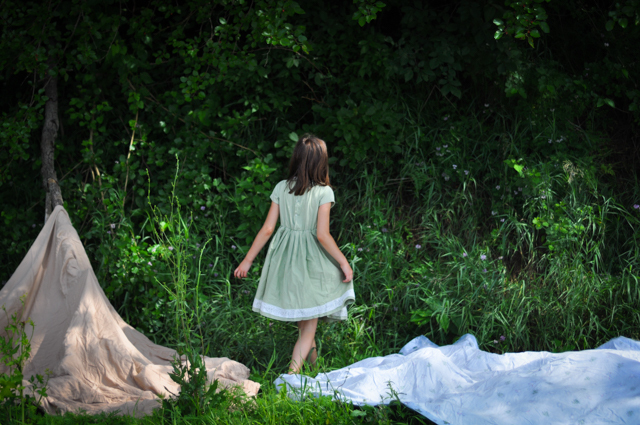 And then someone gave me a tip that involved bedsheets and tree-shaking. And that sounded like just my sort of picking! Yesterday we gave it a trial-run. And our results? Well, I'll let the pictures below speak for themselves. It was the easiest picking ever! We simply spread three large sheets on the ground, then shook like mad to loosen the fruit. And? It worked! Like magic, I tell you. Choose some large pieces of fabric (king or queen-sized bedsheets work best). Whatever you use will be stained with dark purple juice by the time you are done – especially if you bring young helpers along – so plan ahead. Use your own rejects or pick some up at the second hand store. And please don't freak out about your food on someone else's bedsheets. Actually, just don't think about it. Instead, simply wash them twice in the hottest water your washer can manage, then dry before use. That should do the trick of prepping both your brain and your "catching cloths" nicely. 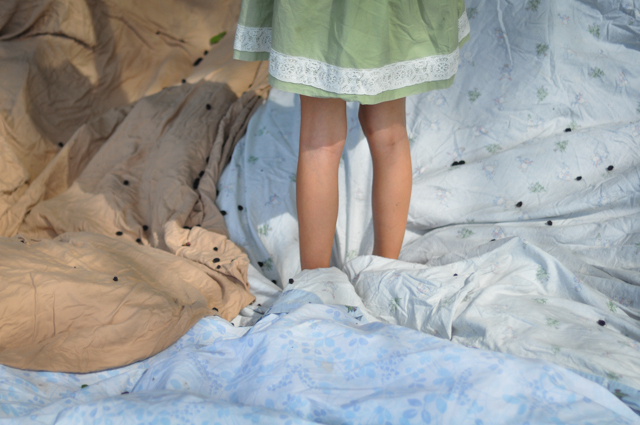 Overlap your sheets on the ground so you don't lose many berries between them. If you can reach the berry-laden limbs of your tree, simply stand on your cloths (we kicked our shoes off first), grab a branch, and give it a vigorous shake. Brake yourself for the rain of berries! If you can't reach (or if climbing sounds like more fun), then up you go! When you've shaken all you can from a particular section, gather your berries up in your sheet. Simply grab the corners and carefully lift so the berries all pool in the center. Then with a stead hand (or four), pour them right into your basket, using the cloth like a fabric funnel. Repeat this process as you work your way around the tree or around the neighborhood. I promise you it will be the quickest fruit harvest you've ever experienced! With your berry stained fingers, hands, and fingernails, eat great handfuls of your glorious harvest. It doesn't get much better than this! The part of our harvest that the kids didn't eat right off of the gathering cloths we brought home for jam, and froze the rest for winter smoothies. And truly – it was so fast. We gathered pounds of berries in under 1/2 hour! That's my kind of foraging. Would love a jam recipe if you have one! Wow! I remember seeing these berries on trees when I lived in Saint Paul MN but I had no idea that was what they were. Mulberries! So cool. Not sure if they grow in Maine but I am hoping to plant a food forest on our suburban lot in the next couple of years so I’ll keep them in mind. Also, your photos are always incredible! We had the same idea this year! Love it! They are much tastier than serviceberries frozen. Also HAVE to say the sunscreen this year is incredible! My kids who hate sunscreen, don’t mind it nearly like they used it. It’s just so smooth….Thank you! I imagine they would grow in Maine! Such similarities between here and there. Thanks for your kind words, Anna! The best sort of filthy kids! THANK YOU! This is the first year we are harvesting from two young mulberry trees (last year the birds got everything) and I have been doing it by hand (holding an old ice cream bucket under the limb to catch some of the escaping berries). Most are gone now, but next year!!! What do mulberries taste like? 😋 I live in the west & have never had them! We have huckleberries!! I’ve never tried to explain them before! I would say similar to mild blackberries – they are sweet, but not overly sweet, juicy, and lack the tartness of other berries. Now huckleberries – there’s a flavor you don’t soon forget! (We tried some right off the bush, just to see. But our jam was wonderful!) Enjoy the harvest.